This was a BIG day!!!! 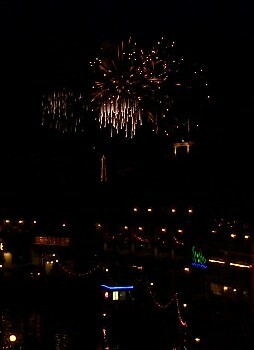 We had to get all our stuff packed up since we were moving to the BoardWalk Villas for the remainder of our stay. After we got the car loaded, Lee dropped me off at Downtown Disney for the Dizpins pin trading meet (Dizpins is a web site that keeps us pretty up-to-date on Disney pins as they become available), and then he went off to Animal Kingdom. I met a number of people that I knew from Internet pin trading and I made a lot of trades - my Disneyland pins were quite popular. The morning flew by and before I knew it, it was time to head over to the International Gateway for the big RADP-V meet. I took a bus from Downtown Disney to the Boardwalk, and checked us in - our room wasn't ready yet (no surprise there), but at least it was one less thing to do later. When I arrived at the International Gateway there were already about 30 people there, even though the meet didn't officially start for another half hour. Eventually there were somewhere in the vicinity of 300 people there - it was pretty amazing. I got to say hello to a lot of people that I'd met before, and a lot of people I only knew via their screen names. But I know there were many more people there that I didn't meet - short of doing some kind of mobius strip reception line, I'm not sure how you solve that problem. :-) A huge RADP meet like that is really an experience - it's fun, but also rather overwhelming. I'm not even going to try to list all the people I met and talked to, because I know I'll leave people out. Lee showed up at about the time the meet started - he'd had a great morning at Animal Kingdom, and said he saw an amazing number of animals on his safari. He'd also had time to see Festival of the Lion King and Tarzan Rocks (also known as Festival of the Loin King ;-) ). Eventually the photographer managed to squeeze all of us into a picture, though I hear we all look like ants. I was standing behind taller people, so I know I'm not visible in it at all. And then there were prizes and "presentations" of various types, and around 2:00 people started to go their separate ways. Lee and I eventually went to the Millennium Village for a quick (late) lunch (I had a chicken empanada and the Praline cake, which was QUITE good). There was a smaller RADP meet at 3:00 to watch the World Showcase players perform their version of "A Christmas Carol" - with audience members playing the roles of Scrooge and Bob Scratchit. Unfortunately no one in our group was selected to play either part - oh well. 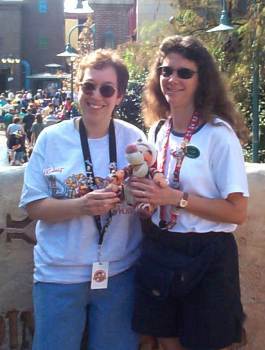 We walked back to Epcot *again* (are you detecting a theme, here? ), and met Debbie Koma so we could all see Cast In Bronze. Cast in Bronze is a musical group that features a rather unusual instrument - a carillon. Which is composed of bells of various sizes and tones - the entire instrument weighs somewhere in the neighborhood of 2 tons. This particular one is the only transportable carillon in North America. (Sure it is - if you have a big enough truck! :-) The musical group also includes drums, synthesizer, and electric guitar - so it's rocked-up carillon music. Hard to explain, but very cool. 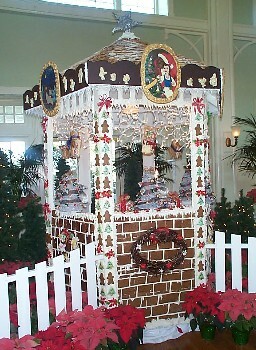 They played Christmas music this time, and Carol of the Bells on a carillon is really quite marvelous. In the past we've heard them play Carmina Burana and Tubular Bells - those are really terrific. Deb went to meet some friends for dinner and Lee and I went to Pin Central for a RADP pin-trading meet. Or I went for the meet - Lee went off to entertain himself for about 45 minutes. I made a few trades, and I met another person I'd traded pins with via the mail - he saw my Disneyland pins and asked if I was from California - and then he saw the nametag I was wearing. That was neat. After Lee got back we went to see the Epcot Tree Lighting ceremony, which is accompanied by Cast In Bronze (since they have Cast in Bronze set up right next to the tree). This is really a nice event - they played more Christmas music, including Carol of the Bells again, and this year they had a vocalist who sang "Do You Hear What I Hear" accompanied by the group. When the "lighting" portion actually started, the various lights on the "Lights of Winter" arches lit up first, and then the lights started twinkling on the tree, until the whole thing was lit. 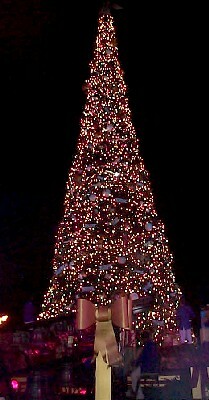 We always enjoy seeing the tree lighting at least once on our Christmas trip. The smoke smell in our room did not really seem much better despite the ozone machine - Housekeeping never came back to pick it up, so we used it on our own a couple more times, but I'm not convinced it really helped - the room STILL smelled like smoke every time we walked into it, though after being in the room a short time we got used to it and could no longer smell it. In keeping with our "Avoid the TTC" rule, we took the bus over to Magic Kingdom - it wasn't even very crowded. We did the (relatively) new Winnie the Pooh ride - I think it's very cute, and there are some neat effects in it, then went over to Buzz Lightyear, where we happened to meet up with the Spencer family, who were just going in, too. 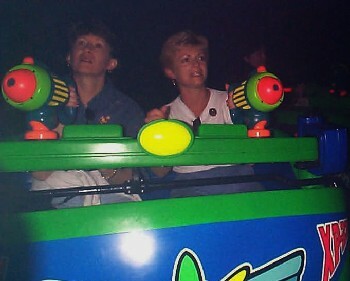 We all did our best to conquer the evil Emperor Zurg - I think Brian had the highest score. I was not, unfortunately, able to repeat as a Galactic Hero. Ah well. The Spencers headed for the teacups, but we opted for a trip to Never Land to visit Peter Pan instead, and then went to Big Thunder Mountain, where we had arranged to meet some other RADP people. 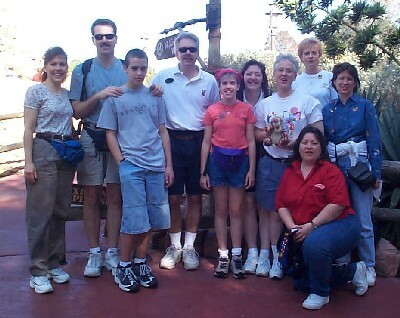 We ended up with a group of about 11 or 12, and whooped and hollered over the "wildest ride in the wilderness". Or I guess it *would* have been the wildest ride, except that towards the end we stopped, and then started again, then stopped, then started again...it was strange, and I don't know what was going on. 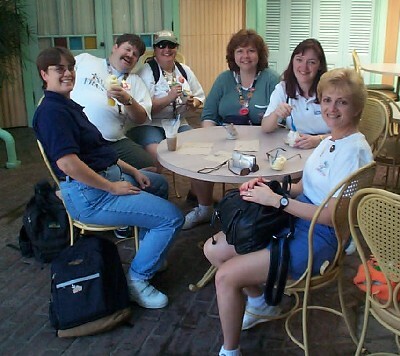 I went to another pin trading meet, while Lee went off to do something else, and then a group of us (Deb K, Rachel, Paragon, and Ronnie) went off to find Dole Whips (Ronnie's treat - thanks, Ronnie!) and to sit and talk for a while, and were eventually joined by Pamela and Sean (and Meeko). 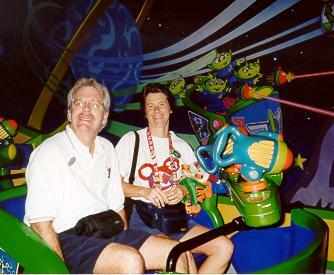 At noon was the Buzz Lightyear meet, which is where Lee and I met up again. The line had gotten much longer, so we all got Fastpasses, and then arranged to meet up about half an hour later. 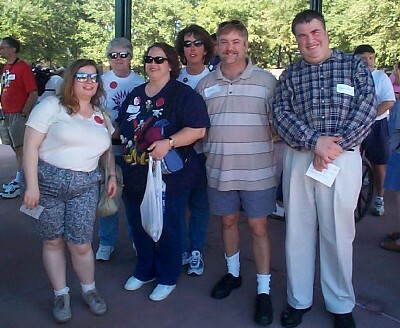 Lee and I went and got lunch at Cosmic Ray's in the meantime, and then we all met up to go into Buzz. I was at the head of our group, and told the Cast Member taking the Fastpasses that there were about 30 of us. :-) He was slightly taken aback, and let a number of people go in the standby line before our group - normally they alternate a bit more. We walked out of the park with DebK and CathyB, said goodbye to them at the boat dock, then we took the monorail over to the TTC (ACK!!!! AVOID THE TTC!!! ), and then changed to the Epcot monorail. It's been a while since we rode the Epcot monorail during the day - it was interesting to see the big hole in the ground where Horizons used to be, and where the new "SPACE" pavilion WILL be - in about 2003. We wandered through Epcot and World Showcase (even bypassing the Beaver Tails) and back to the BoardWalk, where we actually spent several hours relaxing. While we were on vacation. Really! Lee downloaded the pictures from the digital camera (which for some reason was a MUCH slower process than it is at home), and I started working on cropping and re-sizing them. He wanted to see the Main Street Electrical Parade and the fireworks at Magic Kingdom, and I didn't care about seeing them, so he went back to MK to do that. 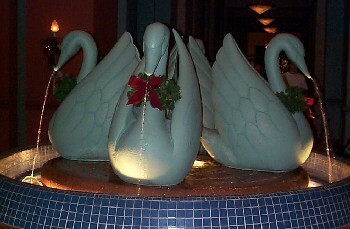 After he got back we got ready and drove to the Contemporary Resort for our dinner at California Grill. We had a late seating - 8:45 p.m. We were having dinner with the Spencers, who were already there and even seated when we arrived (and we were even a few minutes early!) That's unusual - even with priority seating we often have to wait 15-20 minutes to be seated. We had a very nice dinner - Brian and Katie commented that our server kept sneaking up on them - he certainly was great at keeping all of the drink glasses full! We offered the Spencers a ride back to their hotel but they declined. (What, you don't think we could've fit 6 in a PT-Cruiser??? Katie's still pretty small... :-) ) We admired the tree and the gingerbread gazebo in the BoardWalk lobby - BoardWalk did not seem to have cut back on their holiday decorating either, fortunately!